Next-gen Wi-Fi at last-gen speeds! The rollout of Draft-N has hardly been inspiring; poor interoperability and speeds little over the capabilities of existing MIMO-G makes you wonder why all that extra expense is needed? 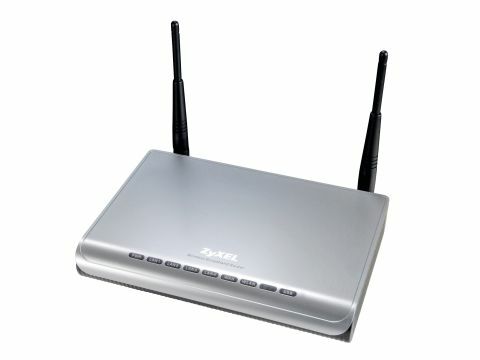 ZyXEL isn't the first name that springs to mind for networking kit, but we're open minded and will give anything a go. In terms of features the NBG-415N router is fully loaded. Four 100BaseT LAN ports plus a WAN port offers strong base connectivity. At heart, it's 802.11 N Draft 1- compliant, and compatible with G and B. A good web interface serves for configuration, and there really is plenty to configure here. Full WEP 64/128-bit, WPA, WPA2 and RADIUS security support, for starters. The usual MAC filtering, NAT/SPI firewall, DHCP server and VPN pass-through are included. There's always a downside, though, and here, performance is disappointing. The router and associated NWD-170N PC card easily put in the slowest Draft-N performance we've seen. The average same-room speed was 4MB/s, which is only a scintilla faster than the 'Turbo-G' options currently available. Move one room away, and speeds drop to an average of just 1.5MB/s. Most N-kits are at least 1MB/s faster, if not twice that. The real killer factor, though, is that it's not even a cheap option.